This September Defected Records and Get Physical join forces on a series of collaborative live events, taking place in London, Ibiza and Berlin and featuring some of the biggest names in house and techno. 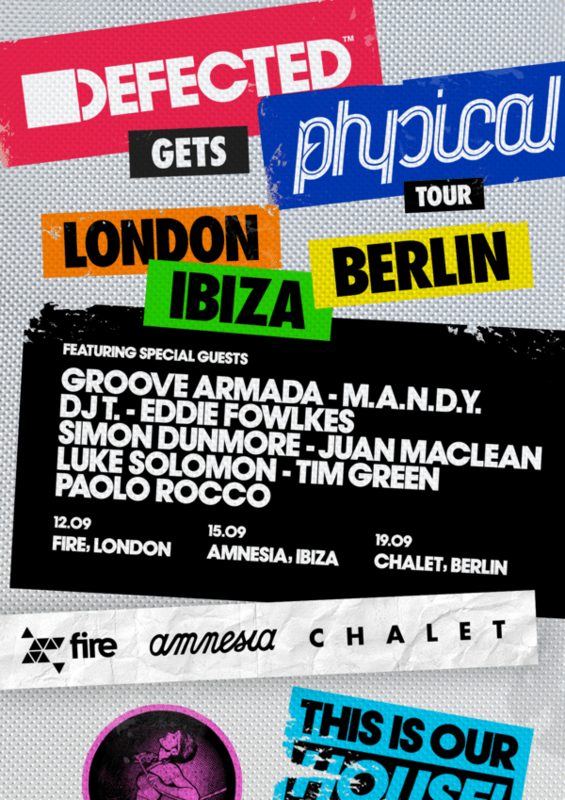 The Defected Get Physical Tour takes place over two weekends this September, with parties at Fire, London (12), Amnesia, Ibiza (15) and Chalet, Berlin (19). Defected and Get Physical are giants in the world of electronic music. As two of the longest-standing and most celebrated labels they set the standard by which other record companies are measured, their respective catalogues including countless seminal, genre-defining records, while their parties are regularly cited as setting house music standards worldwide. The three parties are being held in the undisputed epicentres of the electronic music world, with performances from seminal artists from both the Defected and Get Physical camps. The collaborative spirit of the events are encapsulated in the forthcoming Defected Gets Physical mixed by DJ T. and Luke Solomon mix album, which sees Get Physical co-founder DJ T. compiling and mixing his CD from Defected’s vaults, while Classic Music Company and Defected A&R Luke Solomon gets to grips with Get Physical’s vast collection. In addition to selecting and mixing their respective sides, both DJ T. and Luke Solomon have contributed a number of exclusive re-edits to this pioneering new project. With over 15 years’ experience in championing the very finest artists and music from around the globe, Defected Records’ place in house history is already assured. The recipe for success has been simple and effective; a good helping of adaptability and sprinklings of young talent together with a slice of established names, coupled with a firm belief in the quality of music and artists they represent. Founded just three years after Defected in 2002 by DJ. T and M.A.N.D.Y, Get Physical fast became one of the most reputable and reliable dance labels on the international club scene. Having released music by a staggeringly impressive roster of artists, the label now sits proudly atop electronic music authority Resident Advisor’s all-time most charted labels, a position it doesn’t look like giving up any time soon.